I have more finished objects to report! I did finish the big sweater for my customer on Monday night. I had big help from two of Guido’s podcasts. 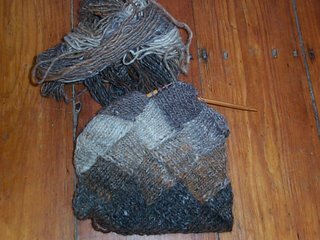 It took one to finish the knitting and another to get the ends sewn in. Stripes are always fun until its time to sew in the ends! 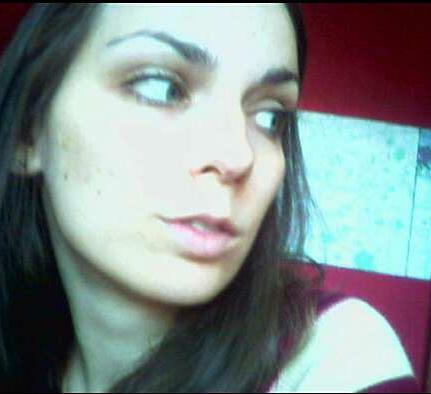 I’ve now unearthed my friend Jessica’s sweater which is done all the way up to the underarm. It has been very strange going directly from size 11 needles to size 3’s. I have three other things I’m working on right now that actually make me chortle to myself while I’m knitting them. The first is this entrelac scarf. A few weeks ago, I saw several entrelac projects both in person and on the web and came down with a case of it myself. I really like it. You can do just one little square and feel like you’ve accomplished something in a day! The next thing I’m tee-hee-ing about is this sock. Kind of looks like a mutant mitten, doesn’t it? 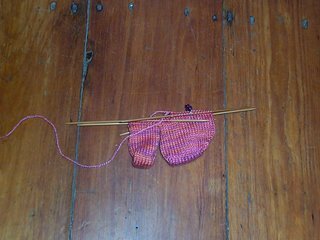 Well, it is the beginning of tabi socks for a friend of mine. I got the idea for the pattern off of Knitty.com. I’ve tried it on my toes and it actually fits! Putting the big toe together with the rest of it was such fun! Last, we have this new yarn. I’m only knitting a sample for the shop but it is the coolest thing! It makes it’s own ruffles! The yarn is actually a two-sided tape. You pick what side you want out and then knit the stitches by poking holes in the side that you want in. I can’t stop giggling while I’m knitting it! I have the overwhelming urge to knit a flamenco dancer toilet paper roll cover for a friend of mine for Christmas. You know the kind with a truncated doll in the top? Someone help me. Oh noes, you've come down with a case of entrelac! That ruffle yarn looks neat. Who makes it? I had a nice conversation with a lady in my Starbucks tonight, as she'd just come from your store with her bag full of sick-fest yarn. So fun to run into other knitters in the wild! 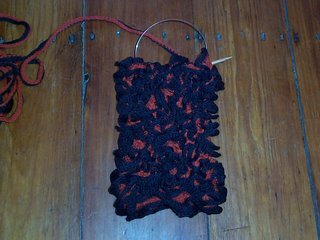 The ruffle yarn is by Online yarns. My friend Wren found it in Europe and brought some back. I found out, much to my amazement, that I had an account with the US distributor so I ordered some! I've only got two colors so far. The rest is back ordered. OMG, I only just now noticed that I'd typed "sick-fest" instead of "sock-fest!" I promise I don't think socks are a sickness. As a skein-carrying member of Sock Club, I believe that socks are normal and healthy, and an addiction to sock yarns is totally normal!